White Rock, BC (GPS 49° 01' 10.92" N 122° 48' 21.90" W) is located just north of the Canada/US border on Highway 99, 45 km (32 miles) south of Vancouver. 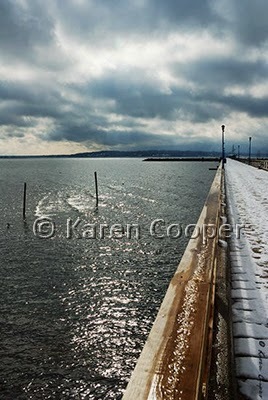 The cold weather makes for some dramatic skies along the pier. White Rock makes a great day trip from Vancouver, with long beach walks and great eateries along the main drag. This time of year it's quiet, and cold. Wear warm layers, then add a couple more just in case. Gloves are nice if you like to feel your fingers.